Are you someone who enjoys riding spinning bikes as much as me? I can’t get enough of it! However, sometimes the seats aren’t comfortable enough to enjoy a quality ride. So, it got me thinking about how to make a bike seat more comfortable so I can enjoy the ride every time. Since this is a topic that you may face as well, I decided to write this article to give you some tips! 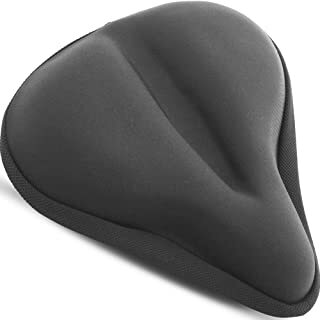 One of the most common sources of bike seat pain that I’ve found is that the saddle is in the wrong position. The seat being too high, or too low, will place undue pressure on different areas of the body that aren’t meant for sitting. The same goes for the tilt of the saddle. Adjusting these two positions to fit your needs may be able to make your bike seat comfortable! When adjusting the height of the seat put your heels on the pedals and pedal backward until one pedal is at the 6 o’clock position. In this position, your leg should be completely straight, with no bend in the knee. If you have a bend, raise your saddle height. If your heel comes off the pedal, lower the saddle height. Adjusting the saddle angle can be a bit harder. Instead of writing the process in the article, I’ve found a great video to help you with a visual. I was talking to a friend who enjoys spinning classes about this topic while putting this article together. She also believed that bike seats hurt and that we needed to come up with a solution. Why are spinning bike seats so uncomfortable? Simply put, not all bicycle seats are comfortable for everyone. This goes for every type of bike, from spinning to road cycling. Since you might be attending a spin class and can’t put on your own seat for every class, the best bet is to invest in a pair, or two, of padded cycling shorts. This is the best way to improve the seat comfort while taking a spin class! They have padding in the areas that tend to be the most sensitive on riders, making the ride much more enjoyable. 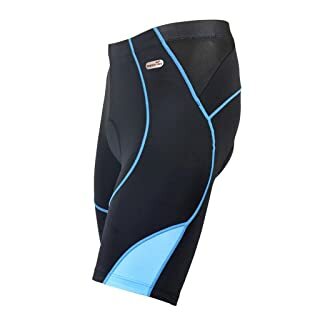 If you are looking for a good pair of padded cycling shorts, I recommend these 4ucycling Unisex Padded Cycling Shorts. They are rated very well and should increase the quality of your ride! If your bike seat hurts after trying the above steps, you probably need to invest in a new seat! All of our bodies are different, so finding a new seat that fits you ensure that you get the comfort you want! Plenty of things can affect whether a bike seat is a good fit for you. If you are like me, you have a health issue that creates more pain from the seat. I’ve had to find a comfortable bike seat for prostate problems. This made me search for a no-nose seat, like this one from Schwinn. Finding the right seat for you will take some research and time. Do your due diligence and buy when you know it will be a good fit! If you are shopping locally, try a few out at the store to get a feel for them. If you are shopping online, make sure to read reviews and ensure people that enjoy the seat have similar builds to yourself. Also, when shopping for a new seat, don’t think that the more padding the seat has, the better it is. More padding can lead to more pressure on your sit bones, leading to more discomfort. Instead, you have to find a seat that fits the distance between your sit bones when looking for the proper seat. This article gives you an easy way to measure that distance: sit on a plastic bag full of flour! Riding Creams – if you go on a long bike ride and have chafing issues from your seat, you can invest in riding creams to reduce friction. Sit Less Often – sometimes you just won’t get around some discomfort from your seat. In this time, it can be a good idea to stand up and ride for a bit to give your sit bones a break. Suspension Seat Posts – if you ride on bumpy trails, you can invest in a suspension seat post to take away some of the force of each bump you hit. Professional Bike Fitting – if you can’t get it right without help, go to a professional to get a bike fitting. They will adjust and change components of your bike to ensure comfort. I hope that you have found some good information to help you improve the quality of your bike ride with more seat comfort! You will probably solve your issues with a quality pair of padded cycling shorts, just like these!